My first challenge feature is on the shop of Sparkly Strandz. 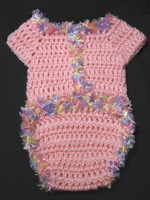 In Sparkly Strandz's shop you will find beaded jewelry, pet necklaces, baby jewelry, and crochet baby gifts. Plus, if you really can't find something you like in her many listings, you can always ask for a custom order and be sure to inquire about how to get 15% off that custom order! She has been crocheting since the age of 5, when her grandma showed her how! 5!! I remember my gramma teaching me how to knit when I was 7ish... but I was 7 ~ it certainly didn't stick! As with most crafty people, crocheting isn't her only love ~ she also creates beautiful beaded jewelry. Her name is slightly misleading though ~ she didn't fall in love with beads because they are so pretty and sparkly. Rather, she's fascinated by their ubiquity. They can be found in most cultures, ancient and new, and come in a large variety of materials. First off, this gorgeous bracelet and matching earrings (sold separately). Starring stunning tanzanite in a soft purple, these wire wrapped pieces are sure to turn more than a few heads. Each bead is carefully wrapped in silver wire, forming links that look a lot like horseshoes. Wouldn't this be a great lucky bracelet? Of course, you can't get the bracelet without the matching earrings! Furthermore, if you aren't a fan of the purple (how can you not, it's so pretty?! ), this would make a fantastic birthstone set. At the moment, there aren't many crocheted items in Sparkly Strandz's shop (but you can always ask! ), but there are a few onesies, and this one is my favourite! Of course, you can ask for it in any colour (black or aqua for boys, or red for Christmas!). Made out of soft wool and accented in multi-coloured eyelash yarn, this onesie is quite sassy!! It is meant to be worn over a regular cotton onesie ~ fancy for those pictures to send to grandma and grandpa! So cute!! Lastly, I just couldn't resist adding a picture of this ring. It is lovely! Made with a soft green flower button (I LOVE buttons! ), this ring can be adjusted to whatever your size. Simply magnificent! So, if that isn't tantalizing enough, there is also free shipping to US and Canada now through Christmas!! Why don't you check out her shop? There are many more striking pieces in store!! You're sure to find something to fall in love with! Also, be sure to hop on over to her blog. If you like, Sparkly Strandz has a mailing list so that you can receive monthly updates on what's in store and any events that are happening. Check her out!! so honored to be first!! I see you really do love buttons! Love your shop. Welcome to the 90daychallenge. What a fantastic feature - I know Sparkly Strandz will be very pleased!